So, every so often I come up with something that’s sort of Japanese, but using British ingredients, and it’s never worked so well as it did with this scattered sushi recipe. It’s really simple, and it’s really good – and it’s great for hot summer days, too. Probably one of the main reasons this works is because the vinegar in the sushi rice dressing mimics the acidity of tomato ketchup. Hey, whatever it is, it tastes lovely. Make your sushi rice – I recommend you buy a rice cooker, as it takes all of the guesswork and stress out of cooking rice. Firstly, wash the rice thoroughly and leave it to soak for half an hour. Then, drain and add your sushi rice to the same quantity of water in your rice cooker. Add the sake and konbu if using, then switch on and leave to cook. Once it has finished, leave it to rest for 15 minutes. Turn the rice out into a damp, flat container (like a pyrex oven dish) and add the sushi rice vinegar. Using a damp wooden spoon, turn the rice gently to coat it in the seasoning. At the same time, fan the rice to cool it and help it to absorb the dressing. Continue until no visible steam rises from the rice, and place it under a damp kitchen towel. Make thin Japanese omelettes by combining the eggs, egg yolk, salt and sugar in a bowl. Add the cornflour dissolved in 4 tsp water. Heat the oil in a frying pan, and add enough oil to coat the base. Thinly cover the pan with the egg, and heat until almost set. Then, turn the omelette over to finish it off. Do not allow it to colour. Continue until all the egg has been cooked, then roll the omelettes up and shred them finely. Fry the bacon until very crispy. Snip into small pieces. Steam the asparagus, and when cooked, remove the tips and slice the stems into small coins. 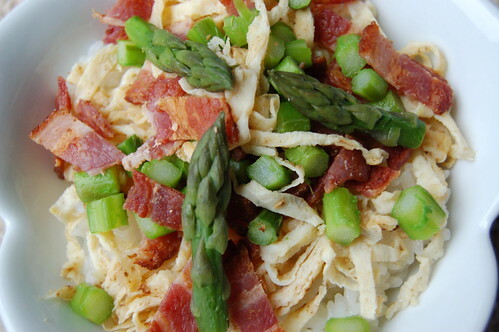 Divide the rice into four bowls, and top with the bacon, asparagus and omelette. There you go, a summery fry-up. Well, sort of.